I’ve often said that I really like days where the reward meets the effort. Today was one of those days that were in perfect balance. Again, so much happened today that it feels like this morning was days ago. We got going at 6:50am and it was still quite windy and cold, but fortunately not as cold as yesterday. We knew bad weather was possible today, but that it was a low chance and that it wasn’t supposed to last all day. We could see the ominous clouds raining in the distance possibility headed our way and also back over Mt Ellen. We were fortunate we timed that summit well to not be up there in rain/snow. It was a road walk for a few more miles and we looked at the next water source(Tarantula Mesa 2) that we could have hiked two miles further to get to. It was not a good source and had no protected camping from the winds, so we made the right choice last night to stop early. We saw Gavin’s footprints for about a mile before they turned off into a rocky canyon to find a place to camp. I tried to follow the prints a bit hoping he might have found my gloves, but couldn’t find him, darn. With our planned routes and resupplies, we probably won’t see Gavin again or for awhile if we do. 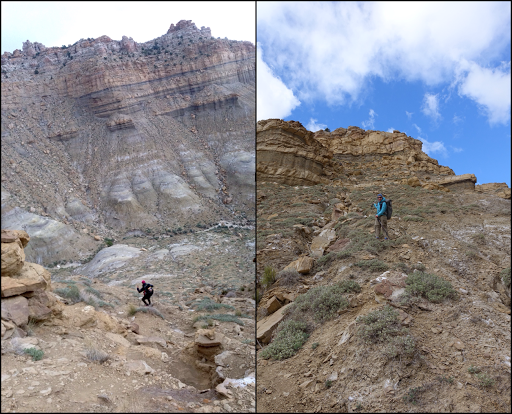 We were in an area called Tarantula Mesa this morning and it’s said to have some of the trickiest navigation of the trip. It worked out fine using the GPS tracks with a couple things that were slightly off, but easy to figure out. Funny because if a track or waypoint is off just 50ft sometimes out here that can be the difference of being on a shelf or dropping into a canyon. 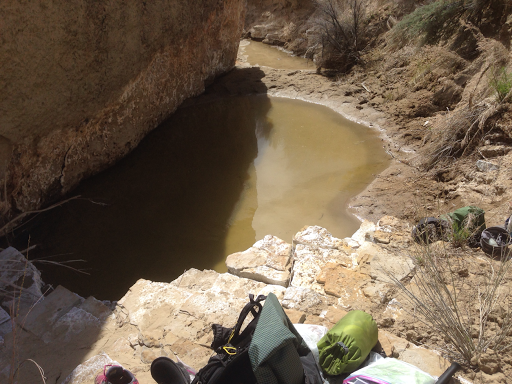 We did, however drop into a canyon that was really incredible this morning. 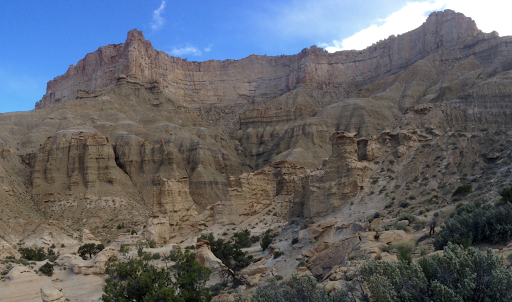 On the map, the best guess is that it might be called Muley Creek Canyon. It’s was grand! Again, my camera does not seem to be working in the cold, so my photos from before lunch were taken either on my iPhone or are from Katherine. The way down was marked by cairns as there aren’t many clear ways down. Just incredible and we loved it! 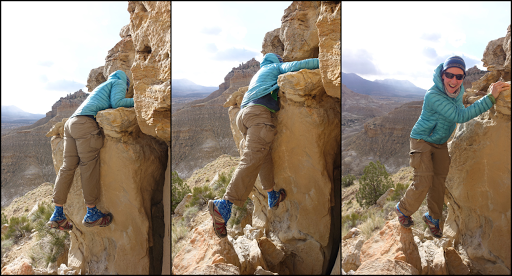 At one point there was a drop that was too high for me and I had to pass my pack down to Katherine before blindly climbing down to find a foot hold. It was amusing. To add to the excitement, there were snow flurries! It wasn’t too cold, but they must have been floating on down and over from much further away with the strong winds. It was a great start to the day! Here’s a view of the descent and looking back up where we came from. 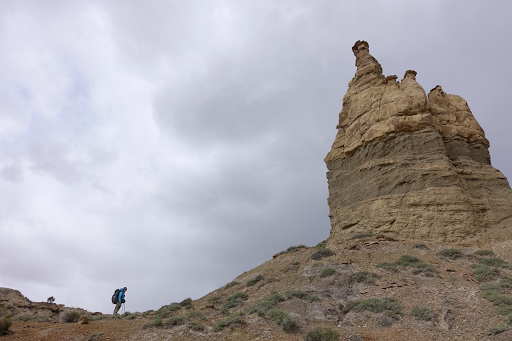 Soon after that, we entered a cool area with unique formations that towered around us. The clouds were moving quickly above us as it was around this time that it even hailed tiny pellets briefly and that was entertaining. We did another one of Nic Barth’s alternates. It was just a few miles, cuts off two miles of the official route (some of the alternates we will do will be longer too), and was more enjoyable than the official. 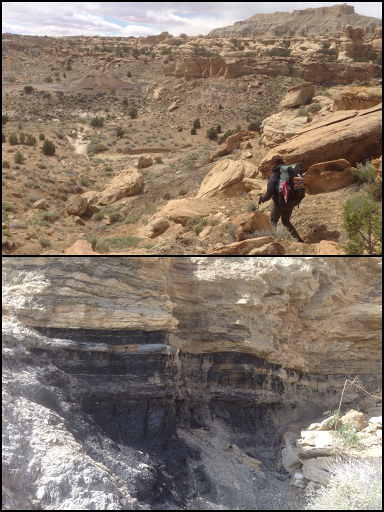 It was some fund sandstone hiking and we even saw coal along the way in the layers of some of the exposed formations. 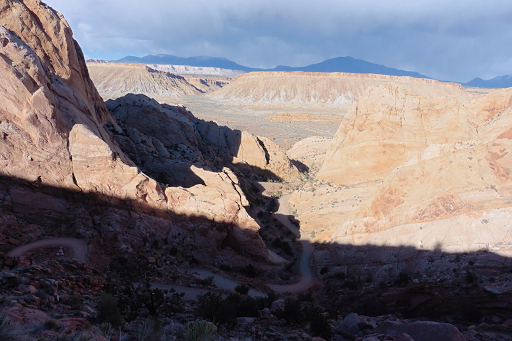 We dropped into a canyon that I don’t think had a name that had a scene that was like out of a dream. Of course a picture just can’t do it justice. Swap Canyon was my kind of canyon! 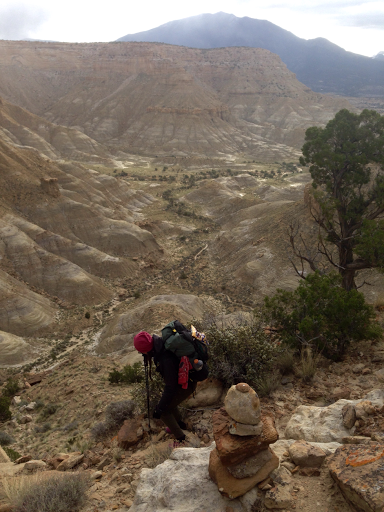 Smooth hiking with a hard packed ground rather than deep sand, and great scenery! 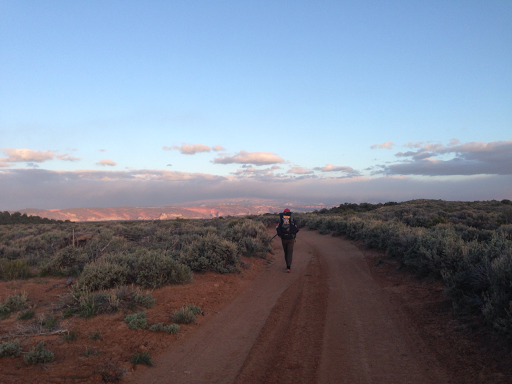 We were in it for an hour or more before reaching the boundary of Capital Reef National Park. Pretty exciting! 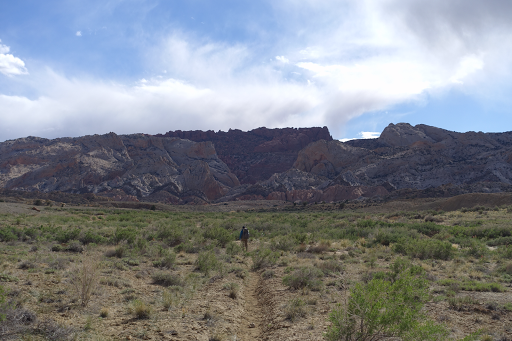 In the distance we could see the long road switchbacks of the Burr Trail (red rock in center) and decided that we wanted to get up that tonight. The map said there was a picnic area up top and that was all Katherine needed to hear. She said she loves picnic tables on a hike and was even more excited about the possibility of a trash can to throw away all her trash and lighten her pack weight. It’s still pretty heavy and she has realized that she packed way too much food for this 8 day ( probably going to make it in 7 days) leg. So her strategy is to eat as much of it as she can to lighten the pack and that means a lot of trash she’d also like do get rid of. Point being, we were motivated to make that 1,000ft ascent. 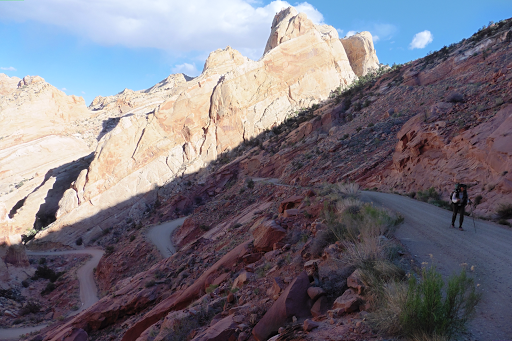 There were just a few cars on the winding road and it was even more incredible to look back and see Swap Canyon, which we just came out of, and the Henrys we came over which seem so far away. I put on the headphones and cruised the gradual road just loving the scenery. A great was to end the day. 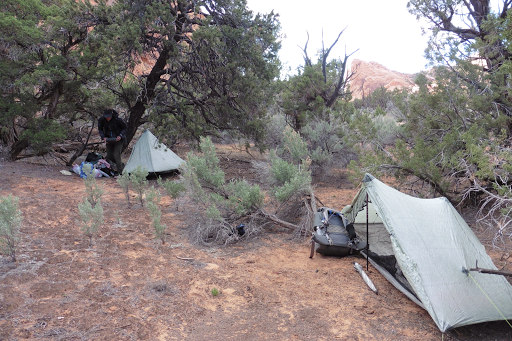 Once on top, we dropped down into Lower Muley Twist Canyon and found a sheltered spot to set up by 6:15pm. The bummer was that there didn’t seem to be a picnic area as noted on the map, so no nice picnic table and no place to dump trash. Katherine had been envisioning this little treat as a nice end of day reward, darn. It’s pretty cold again, but the wind just finally stopped! It might really be gone…what a great day!